the short history of her right breast. and I can't spit it out. My mother asks "Are you worried?" and I listen to her cry. as it will long after you or I die. 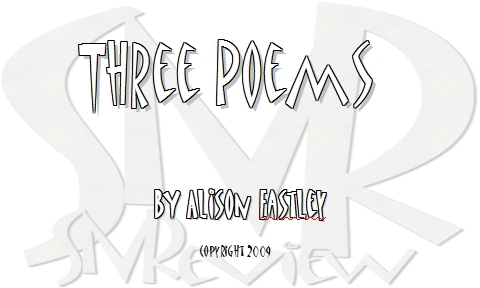 Copyright 2009, Alison Eastley. © This work is protected under the U.S. copyright laws. It may not be reproduced, reprinted, reused, or altered without the expressed written permission of the author. Alison Eastley has published work in Wicked Alice, Mannequin Envy, Segue, Ascent, foam:e, Why Vandalism, many small print literary journals and other excellent on-line literary magazines. After a long history of nursing on a busy/tragic surgical ward ended because of a work-related injury, she is studying for a business certificate and it is driving her insane as it does not suit her interests and her computer is not up with all of Bill Gates's software, making some assignments impossible.